So, an early start to cycle to the railway station in Poole. We arrived with plenty of time to spare and were just unloading the bikes when the train pulled in. This threw us into a panic! ‘Were our watches wrong?’ ‘Had we made a mistake about the departure time?’ We frantically unloaded the bikes, folded them up and bundled them on to the train, fearing it would move off before we were ready. What numpties! We then sat there for 15 minutes before departure! I bet the guard had a chuckle to himself! We had to change trains at Southampton, where exactly the same thing happened. Train pulls in well before time, we rush to load everything on, train then sits there for 10 or so minutes! Not being used to train travel, we naively thought the trains would be more or less empty; after all, it was Sunday and quite early in the morning. Not so, they soon began to fill up and get busy. We arrived on time at Reading West station and offloaded bikes and luggage. We were soon on our way, following the route to the canal that I had previously loaded on to the GPS. It’s at times like this that you really appreciate modern technology, as we would have had a real struggle to find our way down to the canal. Once on the canal towpath, we bumped our way along to Thatcham Station. We were surprised at how rough the path was and at times being only the width of a footpath. The Brommies coped very well with the rough surface, although I can’t say the same for us! We came off the towpath to find the little campsite we had picked out in a village called Bishops Green. We had scheduled a rest day for the following day. Yes, I know we had only just set off and cycled but a few miles: when you’re self-employed, trying to tie up everything before you take a break is always manic and stressful, so we felt we needed a bit of R&R. The following afternoon we were interested to see a very old Land Rover arrive flying the French flag. The couple driving had gone the whole hog, with khaki green tent, military-style clothing, bushwhacker hat… maybe he had been in the French Foreign Legion! 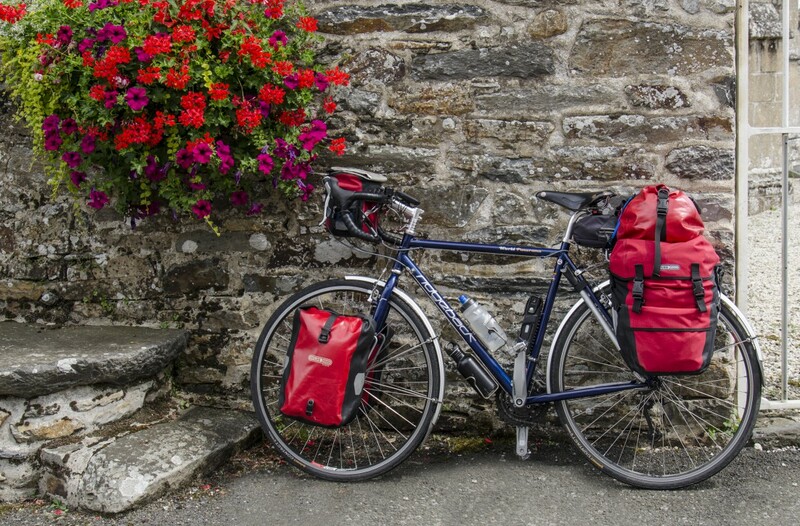 Categories: Bike, Bike packing, Camping, Cycle touring, cycling, Environment, good health, Mike McEnnerney, photographer, Photography, PhotoLink Images, thepedallingphotographer.com, Tourism | Tags: Bicycle, Land Rover, transportation | Permalink.